Il nome "rhodacantha" è formato da due parole greche che significano "spina rossa" in riferimento al colore bruno-rossiccio delle spine giovanili di questa specie. 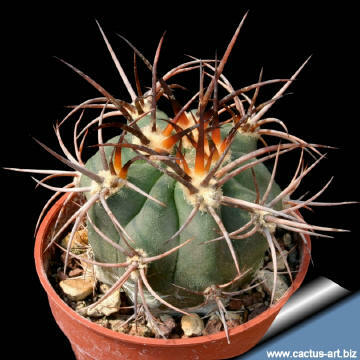 E' un grosso cactus a crescita lenta che col tempo può crescere in forma di colonna. Origin: Widespread throughout the mountains of Argentina (Mendoza to Salta) at 2000- 2800 m of elevation. Habitat: Eastern slopes and foothils. Etymology: The name of the genus is an anagram of the north-western province of Mendoza. Taxonomy: The genus Denmoza comprises only one species allied to Cleistocactus, but it has also been referred to Echinopsis, Cereus, Echinocactus and Pilocereus. 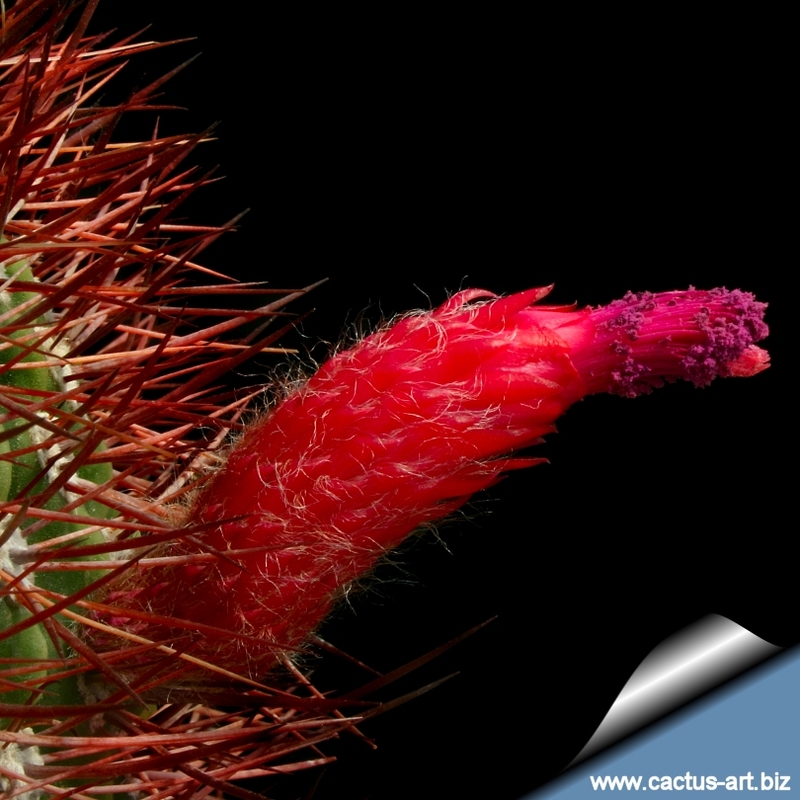 The plants described as Pilocereus erythrocephalus and later transferred to Denmoza has sometimes, for instance by Backeberg, been considered as another species of the genus. D. rhodacantha changes considerably in the habit with age. The description of D. rhodacantha refers to young plants having strong spines in areoles. 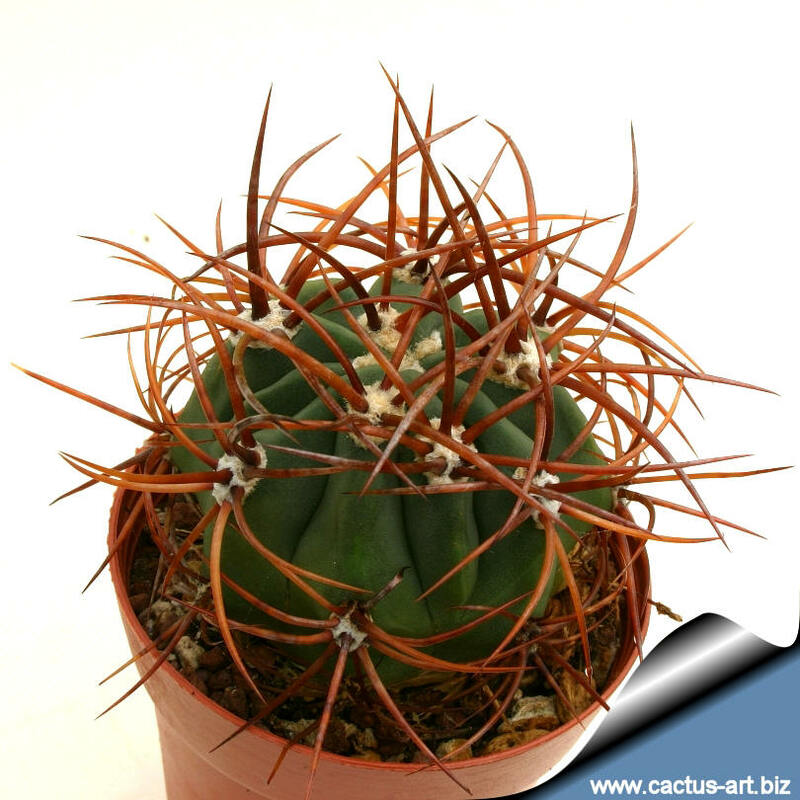 Old plants of the same species with multiple number of spines and sometimes with thin, 6 cm long bristly spines correspond to the description of D. erythrosepala. 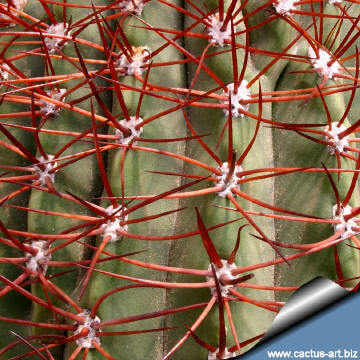 It's specific name comes from old Greek and means "red spine" for the colour of its clusters of spines. 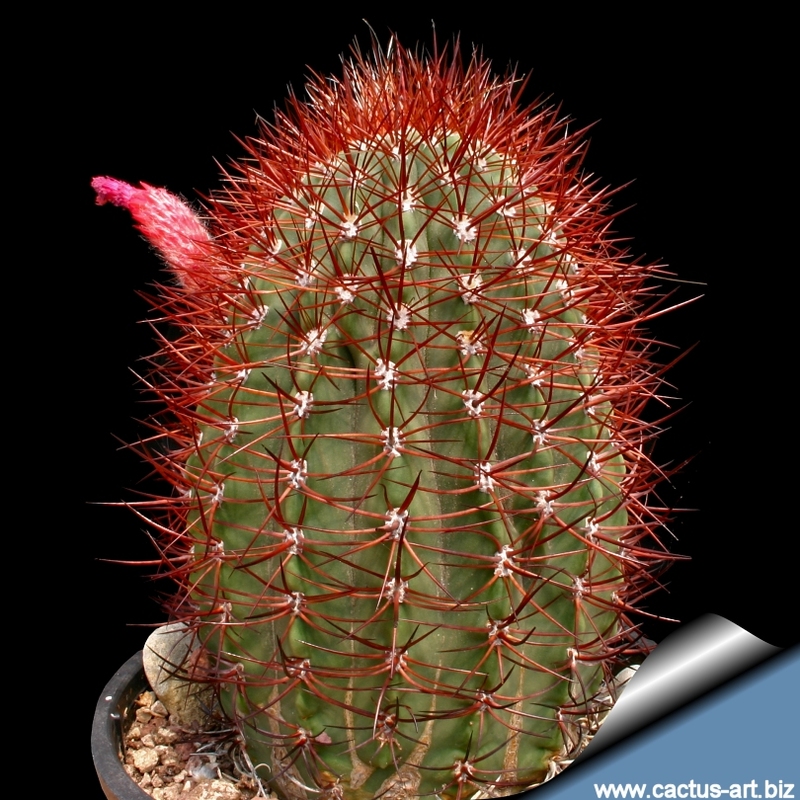 It's a barrel type of cactus and stay globular during a long period before becoming shortly column-shaped. Description: Demnozas is a large slowly growing columnar cactus. It stay globulous during a long period before becoming shortly column-shaped, 0.5 to 1.5 cm high. Ribs: 15 to 30, , parallel straight, slightly undulate, broad basally up to 1 cm tall. Flowers: They need to reach a reasonable size in cultivation before producing their flowers. First flowers appear near the top of the stem, however, on plants of very unequal age and size, some time on relatively young plants but also on 30-40 years old specimens! Flowers are zygomorphous (bilaterally symmetrical), of a maximum length of 7.5 cm, reddish to bright scarlet in colour and have white hair on the tube. Floral tube usually curved and slightly dilatated above the pericarpel, which bears small appressed scales. The flower open sufficiently widely so that the stigma and red stamen filaments are visible from outside. Anther exerted at least 10 mm beyond the tube. Fruit: Globose, dry at maturity, dehiscent with tuft of short hair-like spines. The spines shape and colour of this species is variable. D. rhodacantha also changes considerably in the habit with age and the old specimen after many years start producing long white bristle. Cultivation: D. rhodacantha is very slow growing cactus but requires no special condition in cultivation, need full sun and a very draining soil.